If you asked me what's worse than a man or woman who lies or cheats? My answer to you would be disrespectful children, men or women. It always makes my blood boil, when I see a man or woman disrespecting each other in public, arguing, fussing, fighting or cursing each other out right in broad day light. Then there are others that are so bold that they would argue, fuss or fight right on Facebook, Twitter, My Space or other social networks laying out their dirty laundry for the whole world to see. What really is sad is when men or women go so far as allowing their outside man or woman to have sexual relations in their bed. It makes you ask this question, You mean that you are so hard up, hot or horny that you can't wait until you or the person you are interested in gets a hotel? Why would anyone use their home to disrespect their husband or wife and why would they use their spouses income , money or material possessions to help someone else? What's really sad is when children are also the witnesses to these arguments, fights or the parents cheating ways. No child enjoys seeing or hearing their father or mother fight and many of them hate it when their parents or step parents put them in the middle of their drama or mess. To me its crazy and never smart to involve children or to even ask them too give their opinion on a persons spouse or mate. Why? Well for one thing they are still children and many are incapable of giving sound advice. I am a father of four and when it comes to my relationships I never seek advice or involve any of them in my decision making. Another thing that has always made me mad or had my blood boiling, is hearing or seeing children disrespect their parents or elders in public. Some of these children forget that is was their parents that cared, help educate, fed and kept a roof over their heads, until they were old enough to fend for themselves.You would think that when children grow up and then become adults that they would appreciate their parents more. But from what I have experienced or found out that it doesn't matter if you are rich , poor, great , or a very good parent some children will never give their parents the respect they deserve. Some have been known to abuse their parents verbally or physically and in those rare case some have even murdered their own parents. That's why even today most children don't have an solid relationship with any of their parents. I have found that some parents don't or won't have anything to do with their disrespectful children because of their shameful behavior. What's funny to me is that some children feel like their parents really owe them something, when in fact their parents don't owe them nothing at all. Its my opinion when a child is old enough to take care of themselves then their parents job is done. After that its up to the parent if they want to help their grown child or children in anyway. This reminds me of something my late grandmother would always say, when it comes to relationships, marriage or raising children. When she would say," Baby, if they don't respect you at home, then they won't respect you in the streets. If they can disrespect you in public, imagine what they would do to you behind close doors. Without respect no marriage or relationship will ever work and disrespectful children will always break up a happy home. 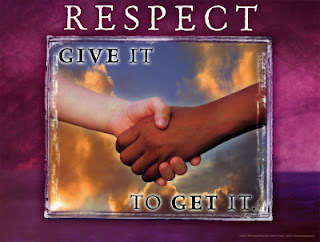 Its always about RESPECT earn it, give it, live it and always demand it ! RESPECT! Write in then express your thoughts, veiws or opinions on the subject.